with NO Welding to the carrier pipe. 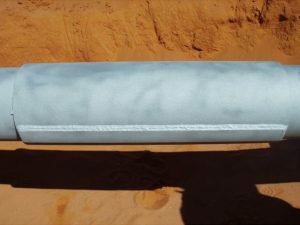 PETROSLEEVE installation can achieve full compression throughout all operating ranges. 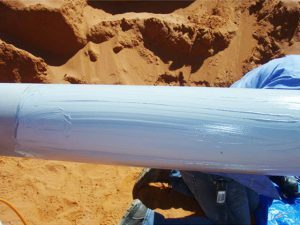 With the PETROSLEEVE® meeting and exceeding Z662 standard, the Oil & Gas Industry benefits from a revolutionary repair method for permanently repairing pipelines. Prior to the recent June 2003 Z662 code issue, the only acceptable method to repair stress concentration type defects (i.e. cracking) was by grinding, welding on a pressure-containing sleeve, or cutting out the defect. Today, the PETROSLEEVE® Repair System offers pipeline owners an incredibly cost effective, safe, reliable and proven solution! To date, over 1700 PETROSLEEVE® Repair Systems have been installed in the USA, Canada, Mexico and, most recently, in the Dominican Republic. PETROSLEEVE® Inc. has now received the updated epoxy MSDS sheets for 2013.The product manufacturer did a complete MSDS analysis of the epoxy which has resulted in some significant positive changes to the product MSDS information. Particularly, the epoxy is no longer considered dangerous goods for shipping. This is particularly significant for air transportation; however, does have savings when shipping by ground or sea as well. The epoxy specifications and technical data remain unchanged. The packaging will still consist of two parts, Part A and Part B. The Part A is shipped in a container that has the capacity to hold the entire contents of both Parts A & B. You only are required to transfer all of Part B into the Part A container and commence mixing. Neither Part A nor B is considered Dangerous Goods for transportation purposes. Although the epoxy is no longer considered dangerous goods for Transportation, please remember to read, understand and follow all information provided on PETROSLEEVE® epoxy MSDS sheets. Specially designed tools such as clamps to ensure an appropriate installation every time. Used to clamp small diameter sleeves in position during installation. Used to clamp large diameter sleeves in position during installation. 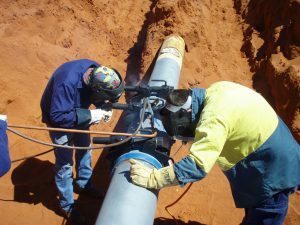 Welding of Petrosleeve to itself to complete the installation. The PETROSLEEVE® installation is easy to learn and easy to teach others. The PETROSLEEVE® is a non-intrusive repair system that is easy for any crew to perform. 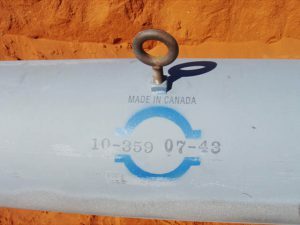 There is no welding to the carrier pipe. Free EIP(Engineering Installation Parameter) Software calculates, records and confirms stress conditions of each installation. Each PETROSLEEVE® comes with an installation kit which contains the epoxy mixing tools, and cleanup tools necessary during installation. Comes in a set of two and assists in raising the lower half of the PETROSLEEVE® into position. 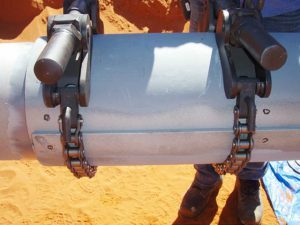 The Hoist Cradle comes as a unit and assists in raising the lower half of a large diameter PETROSLEEVE® into position when the half can not be managed by hand.